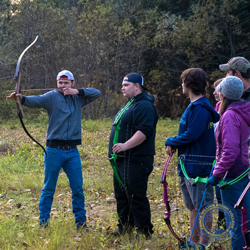 PWSC’s Archery Club offers something for anyone interested in the sport of archery, whether a beginner, experienced competitive target archer, bowhunter or a recreational shooter. 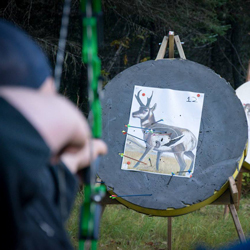 PWSC Archery offers classes, club membership, workshops, and youth camps for all levels of experience and skill. 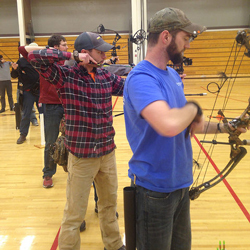 The PWSC Archery Club is a student governed organization in association with USA Archery, which is open to all students, faculty, staff and community members. Privileges of membership include participation in all club events, use of club equipment at events, use of club ranges and range times, archery instruction, coaching, and equipment discounts. At each club event, club officers, team members or advisors will be available to assist with instruction/coaching. This benefit is free, no registration required, no experience, no equipment needed. As a member you can use our equipment until you choose to purchase your own. Individually arranged instruction/coaching are available to members at an additional fee. Contact the club president or advisor for details. The club is always looking for fundraising opportunities. For a reasonable donation we can provide an archery wellness activity for your business and employee group or perhaps for your child’s birthday party. Have other ideas? Contact the club president or advisor. If you are a student and would like to be involved in the leadership of this awesome organization, please attend the next club meeting and wave your hand! Perhaps the experiences gained from your efforts here will open doors later in your life’s adventures. The 9th Annual Vegas in Valdez Archery Tournament was held on March 21-24, 2019. This event is made up of 4 days of fun shoots, games, outdoor gear vendors, and instruction.